Quick Control screen: In the advanced exposure modes, you can choose the option via the Quick Control screen. To do so, select the Image Quality option. Then rotate the Main dial or Quick Control dial to cycle through the available settings. Or give the option symbol a tap or press the Set button to display the screen shown on the right, which contains all the possible options. On this screen, tap the options you want to use. Or, if you want to go old-school, use the Main dial to change Raw settings, and the Quick Control dial or the Multi-controller to select a JPEG setting. Tap the Return arrow or press the Set button to finish the job. Shooting Menu 1: You also can access the Image Quality options via this menu. After you select the menu option, you see the screen shown on the right in the image above. Going the menu route is the only way to change the setting in the fully automatic exposure modes. You also can select the option via Shooting Menu 1. 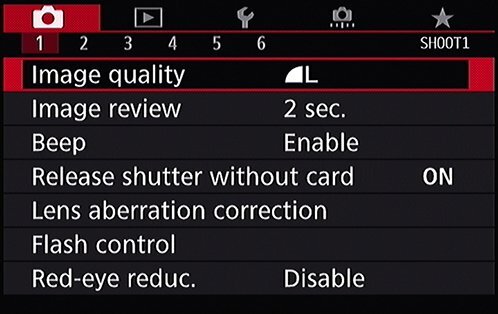 At the bottom of the Quick Settings screen, you see two bits of information about the current setting: the resolution (pixel count) and the number of subsequent shots you can fit on your memory card at that setting. The next two rows of the settings screen show icons representing the Image Quality settings. The settings marked with the little arc symbols capture images in the JPEG file format, as do the S2 and S3 settings. The arc icons represent the level of JPEG compression, which affects picture quality and file size. You get two JPEG options: Fine and Normal. The smooth arcs represent the Fine setting; the jagged arcs represent the Normal setting. Both S2 and S3 use the JPEG Fine recording option. Within the JPEG category, you can choose from five resolution settings, represented by L, M, and S1, S2, and S3 (large, medium, and small, smaller, smallest). For all shooting modes except the HDR Backlight Control and Handheld Night Scene modes, you can select the Raw file format, and you can specify whether you want the file captured at the maximum pixel count (the plain old Raw setting), medium resolution (M), or small (S). You can capture the image in both the Raw and JPEG formats. Of course, this option fills up your memory card faster because you’re creating two image files. To bypass one of the two formats, select the horizontal bar at the start of the line. The Main dial and arrow icons to the right of the file types are a reminder that you can use the Main dial to cycle through the Raw settings and press the Multi-controller right/left to select the JPEG settings. You also can use the Quick Control dial to change the JPEG setting. If the touchscreen is enabled, though, it’s easier to simply tap the setting you want to use. Which Image Quality option is best depends on several factors, including how you plan to use your pictures and how much time you care to spend processing your images on your computer.